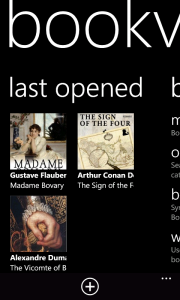 Bookviser is a free application for downloading and reading electronic books (eBooks) on Windows Phone 7. With Bookviser you can read texts in EPUB, FB2 and TXT formats as well as import EPUB, FB2 and TXT files from your own collection right on your phone. It also allows you to search and download FREE public domain books as well as original books from digital libraries like Feedbooks. If you need more information please contact the developers of Bookviser (Bookviser Development Team), or check out their product website.